Will These Running Shoes Make You Faster? Look what just vaulted into the already crowded running shoe market—another crazy-looking shoe and its, so far, single-product brand. 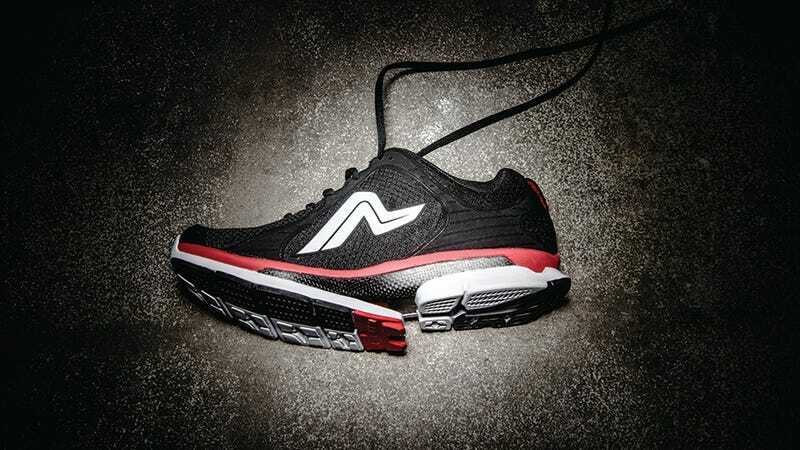 With a carbon-fiber flanged sole, the Ampla Fly is designed to give a little boost, maximizing the force of each push-off, say the creators, athletic shoe industry veterans David Bond and Tom Hartge, and sports science physician Dr. Marcus Elliott. It's also supposed to reduce injury and improve running form. But what makes this shoe really different, other than the nifty springboard sole of course, is that it's the first running shoe based on science, not marketing fluff or sales directives, Elliott told Competitor. Wait wait wait... gel and torsion bars, marshmallow soles and slapping rubber glove soles, freedom and control and mattress coils and air pockets—weren't all those innovations based on science too? In fact, every athletic product I can think of, from compression socks to moisture wicking shirts, was based on science—Nike science or Red Bull science or Under Armour science. What the hell, marketing and sales are based on science, consumer science, that says consumers dig science. The sticky thing about science is that it's supposed to be, by nature, impartial and independent. I'm sure the Fly is backed by thousands of data points and high-speed cameras and force plates and white lab coats, but Dr. Elliott is neither impartial nor independent. That said, the concept of spring-loaded propulsion is not rocket science, or maybe it is rocket science, ha. At any rate, it's intuitive, plausible (though I would worry about pebbles and sticks getting stuck in the flange). The other claims of reducing injury and improving running form are less obvious. Thus, the catapulting trainers also come with caveats. Team Ampla warns the Fly is not for every runner, saying that for best result, runners need to do drills, form work and strength training. It sounds like beginners may not be Fly material, nor the weak or slow or those with gout. The Fly is also not suitable for the poor: It will be available in February 2015 at very special running stores in the US for $180.